Archive for Strike Witches 2. Barkhorn is awesome because she's always serious. 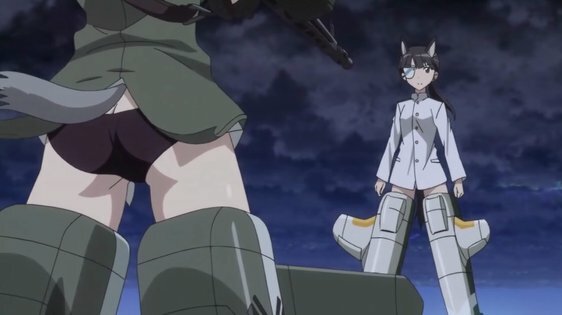 After re-watching the first season of Strike Witches while waiting for more episodes of Strike Witches 2, I've concluded that the sequel surpasses the original—at least through the latest four episodes. 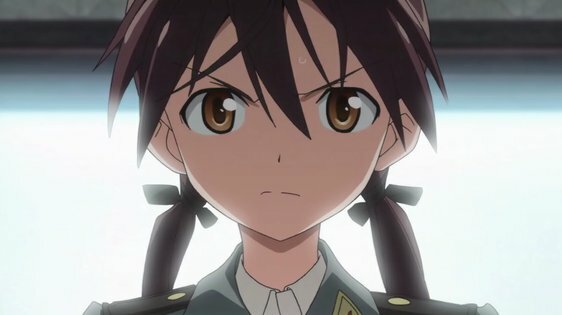 The real problem with the first season of Strike Witches is the show takes a tremendous dive during the final third of the show. The instant Wilcke pulls out that pistol the show effectively gets shot out of the sky and goes down in flames. 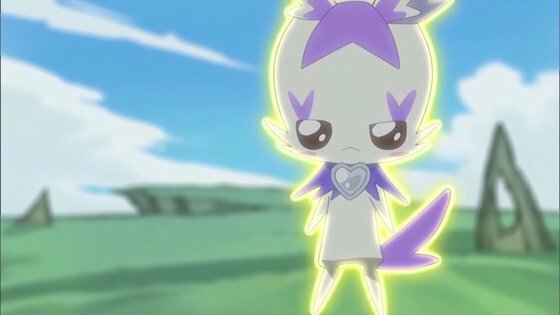 The final three episodes of the last DVD were especially bad. I love it when Barkhorn calls Yeager "Liberion." Season two, on the other hand, returns to the elements that made the first season enjoyable. I am in favor of a retcon that wipes the "plot" episodes of the last season, merging the rest of what's left into a single continuous arc. 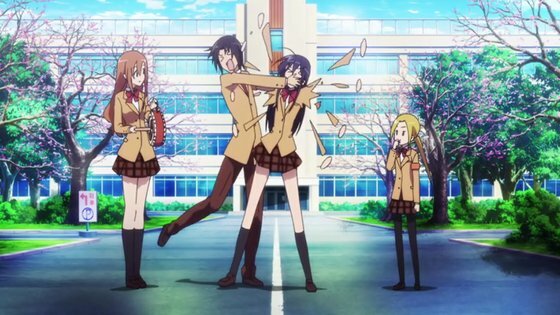 True, in some respects the second season has been too much like the first season. 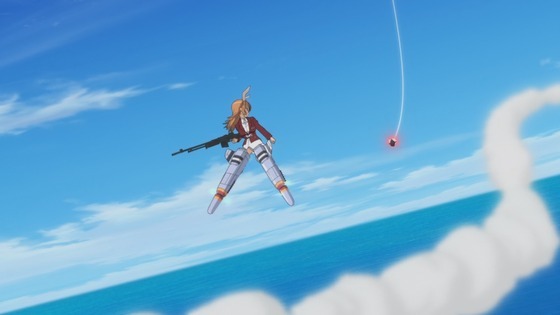 For example, the recent episode about Karlsland's experimental striker unit evoked many of the same elements found in Charlotte Yeager's supersonic episode from the first season. But c'mon, Gertrude Barkhorn with JETS! The very idea brings a tear to my eye. So beautiful. The very recognizable Charlotte Yeager. Besides, it's not all the same. There were numerous problems with the broom-training episode, but don't overlook the positive aspects it brought. First, it reminds us that the Strike Witches really are witches, as opposed to traditional magikal girls or true mecha musume. Second, it brought Perrine-H. Clostermann into the Lynette Bishop and Yoshika Miyafuji clique. Gallia's haughty witch was a bit of an outcast the first season, so it's nice to see her with friends this time around. It's easy to forget she's also one of the younger members of the wing. Hopefully Ursula isn't a complete slob like her sister. Minor changes are the keys to success here. All too often sequels seem all too eager to screw up a good thing by making it bigger and better. 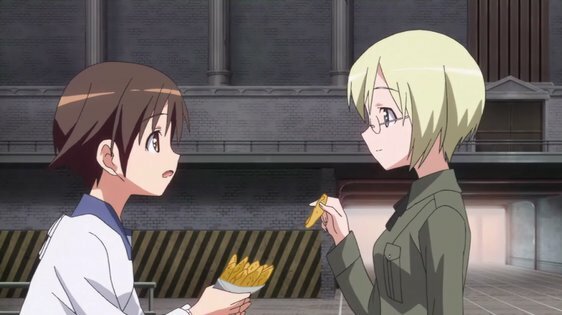 Cameo appearance by Ursula Hartmann aside, I'm really glad Strike Witches 2 has not fallen to the temptation to overload the show with more and more witches. 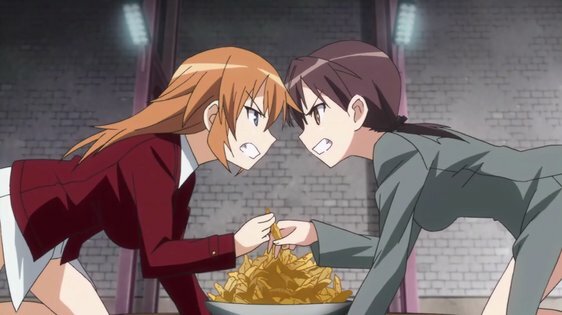 There's no question Strike Witches 2 could still crash and burn, but as long as it stays the course, I'm content to let this war go on as long as it has to. It kinda bugs me that when Charlotte Yeager's BAR jammed she (1) didn't make any attempt to clear the malfunction, and (2) didn't have a side arm. Okay, sure, a real-world .45ACP would be useless during an air battle, but Yeager still could have drawn a Colt 1911 in that situation. I'm pretty sure they're all using magic weapons anyway—at a minimum, ones with unlimited ammo and barrels that don't overheat. 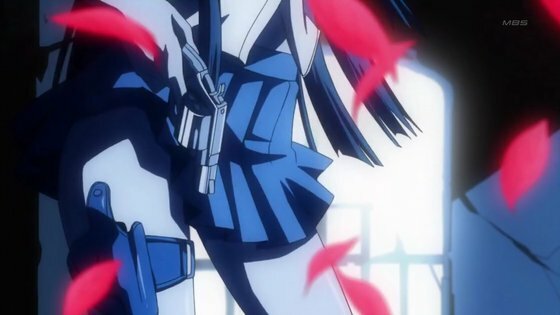 Most of the shooting was rather magical, but in the beginning of the original GONZO SW we saw Sakamoto's gun overheating (just so that she could switch to sword).